I made this dessert for our granddaughter’s second birthday–it was a hit! I can’t always understand what she’s saying, but “Birthday Cake” came out loud and clear. A festive family gathering it was, complete with a rolling-weasel ball that made her giggle in delight (hey, the label says it’s for pets AND children). 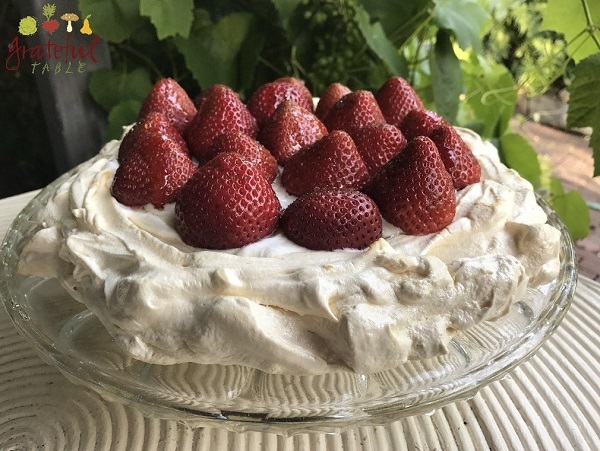 A similar dessert, “Pavlova”, has fresh fruits garnishing a meringue crust, with plenty of whipped cream in between. I wanted to use the egg yolks though, so the chocolate mousse gave me a way to work those in. I guess you could also call this “Gluten-free Chocolate Dessert”, since that’s the trend lately. Or maybe, “Healthy Chocolate Pie”, since it uses bittersweet chocolate and not very much sugar at all. Oh, who am I kidding?! I just love meringue, and take any excuse to eat it! I feel really good about eating this “gluten-free” dessert. Yes, it has a bit of cream, and some sugar too, but still seems to be a light dessert. My friend has often made the lemon curd version of this for our women’s group celebrations—it’s also quite delicious! Refrigerate mixture. Let cool completely (making a day ahead is convenient). On serving day, prepare meringue crust. Heat the oven to 250 degrees. Using a 12-inch round cake pan, trace a circle onto a piece of parchment paper with a pencil or marker. Flip the paper over and place it on a baking sheet (the traced circle should be visible); set aside. Bake until the meringue is firm to the touch but slightly soft in the middle, about 60-70 minutes. Remove from the oven, place the baking sheet on a wire rack, and let cool completely. Run a thin metal spatula under the meringue to loosen. Carefully slide it onto a serving platter or cake stand; set aside. Set whipped cream aside; add cooled chocolate mousse to bowl and whip until light. Fold in half of the whipped cream. Spread the chocolate mousse onto cooled meringue.